DPS digisonde can operate in the multi-beam sounding mode using six digitally synthesized off-vertical reception beams in addition to the vertical beam, as shown in Figure 1. For each frequency and height on a multi-beam ionogram, the raw data from the four receive antennas are collected and processed to form seven beams , separately for the O-mode and X-mode echoes. For each frequency-range pixel, the beam with the maximum amplitude is selected, and the amplitude and beam numbers are recorded in the output data. 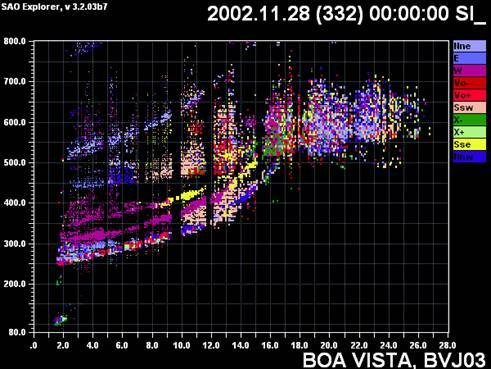 Previously, the “BEM” format of binary ionograms had the maximum number of stored heights restricted to 128 and did not allow multi-beam processing of X-polarization data. A new digisonde ionogram format has been developed, “Routine Scientific Format” (RSF), that contains complete amplitude, Doppler, direction, and beam phase information for each combination of polarization, frequency, and height. The supporting software for data display and analysis, SAO Explorer and View2GIF, has been updated to support the new RSF format. The sample RSF ionogram from Boa Vista, Brazil, in Figure 2 shows the detailed structure including the reflections from a nearby bubble. Figure 3. 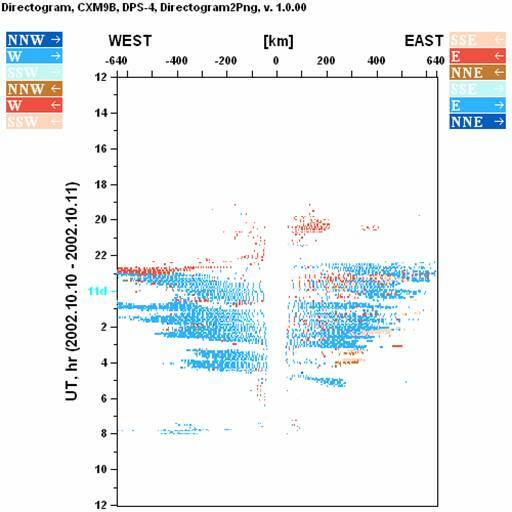 Sample directogram for Cachimbo station from 12 UT Oct 10 to 12 UT Oct 11, 2002. 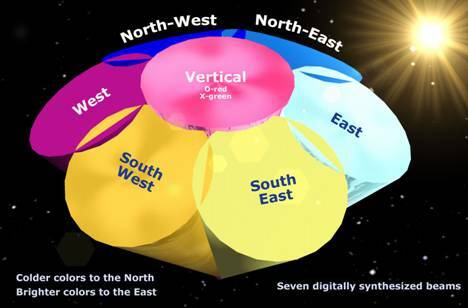 Blue color means ionospheric motion from west to east. where Hv is a representative vertical height of the F-layer that is estimated from the ionogram by locating the section of the vertical incidence F-trace where amplitudes are big and height gradient is low. When a manually scaled trace is available, hminF can be used reliably as Hv. For the autoscaled data, more consistent results are obtained by calculating summary amplitudes for all frequencies of vertical echo for each ionogram height and selecting hv as the height of the biggest amplitude. Information about directions and distances of oblique echoes can be stored in DRG file. One DRG record can be created from one ionogram. Each record contains 14 lines of information. The following is explanation for every line. DRG file can contain many individual records.